This page is a translated version of the page Stylomine and the translation is 100% complete. Stylomine is one of the oldest French producers, which is highlighted in the fountain pen history for the unique filling system (which, by the shape of the sac, is called accordion filler) which distinguished his pens, and that after the relevant patent expiration was adopted by many other French producers. Although the produced models were few, the company production was always high quality, and very interesting in the French market, where the company was one of the most significant actors. The company distinguished itself by technological innovation, having patent an hooded nib before the Parker 51 one, but like all historical French manufacturers could not withstand the impact of the advent of the ballpoint pen and disappeared from the market in the early 60s. An exact date for the founding of the company created by Yves E. Zuber is not known but its activities originates at the end of the first World War, with offices and factory in Paris on Rue Neuve des Boulet, 34-36 and in the Rue de Nice, 2 and later on Avenue Martin Moreau, 45. The company was initially active on the market in the molding and assembly of metal parts, as bag hooks or clips and nibs for fountain pens. 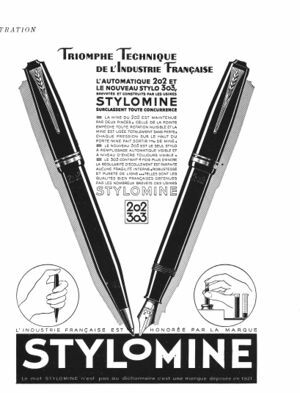 The Stylomine brand was officially registered in 1921 with n. 199226, and was used by Yves E. Zuber for his pencils. The fountain pen production began only in 1925 with some safety models in black or red/black marbled hard rubber. It was relevant also for the production of overlays in both rolled gold or precious metals. But in this period the most characterizing product for the company production was the Autostyl mechanical pencil, in which the mine is automatically replaced after exhaustion. The production of mechanical pencils continued for all following years, with different names such as Stylomine Automatic and Stylomine 202. But the fountain pen which made famous Stylomine is the 303 model, introduced in 1930 and equipped with a series of very peculiar technical solutions, as an advanced bulb filler system, very functional and with high-capacity thanks to a breather tube ingeniously connected to the feeder (patent nº FR-712327), which allowed the full loading of the pen with only four or five strokes. In 1933 was created a very special re-entrant nib mounted on a spring that was made by screwing the cap back by the pressure of an inner tip (see nº FR-737930). This system was used in the new 303B model, produced in three versions corresponding to three different sizes. The filling system was a refinement of the previous one of 303 and was also used for the 303C model, made in celluloid and without the re-entrant nib, for which, in addition to the three previous dimensions, was produced also a fourth size, large enough to call it Mastodonte. But the most significant invention of the company, which is its distinguishing feature, is the revolutionary accordion filler, patented in 1938 (nº FR-854177). It's a peculiar variant of a breather tube filler allowing a very large ink capacity, in which the pumping was carried out thanks to an ink sac with accordion walls, and in which the bulb was replaced by a button consisting of a glass ampule inserted to slide in the rear end of the body, that you could press to make the pumping, and also use to see the remaining ink. it's also very relevant the development of the 303D, an hooded nib model, perhaps the first ever produced. Its patent (nº FR-850525) is in fact from 1938 and anticipates by several months the corresponding (nº US-2223541) Parker patent for the 51, but the company still had patented an hooded nib since 1932 (nº FR-750689). So the company seems to have beaten Parker in terms of innovation. In this case, however, we don't known the exact dates for the market appearance of the model, which in some cases is reported as much later. Around 1937 was launched also the model 303V (the date is still somewhat uncertain), with the new accordion filler system, a more streamlined shaped style respect to previuos models, and the use of a plastic material body (which arise the suspect of a later appearance). The postwar period saw the spread of the hooded nib 303D model, flanked by other models such as the Super 303 with round tip nib. The accordion filler was maintained replacing the glass button with plastic material. In 1947 were introduced the Stylomine 404 mechanical pencil and in 1948 was introduced the Stylomine 707 ballpoint pen. The company tried to respond to the crisis introduced by the advent of disposable spheres: the 505 lever filler model was introduced (now very rare), the company also joined to Météore, Paillard and Unic to produce the Pulsapen, and formed a consortium with Bayard and Unic to create the BUC cartridge. It also introduced a cartridge model recovering the historical 303 name. But as with most other historic French manufacturers, the efforts were useless and the company ceased operations in the 60s. ↑ therefore we will use the 1921, registration date for the trademark, as foundation date. ↑ date and number are reported in this advertisement. ↑ As reported in http://www.stylos-francais.fr/stylomine3.php this article the introduction would be in 1947. ↑ this is what is reported in this article. This page was last edited on 22 April 2019, at 13:22.